On September 8, 2011 fashion week had already hit NY like a snowstorm with models hitting the runways and events going on non stop. This night was called Fashion's Night Out. On this day in particular, the make-up conglomerate Sephora held one of its biggest events in fashion. 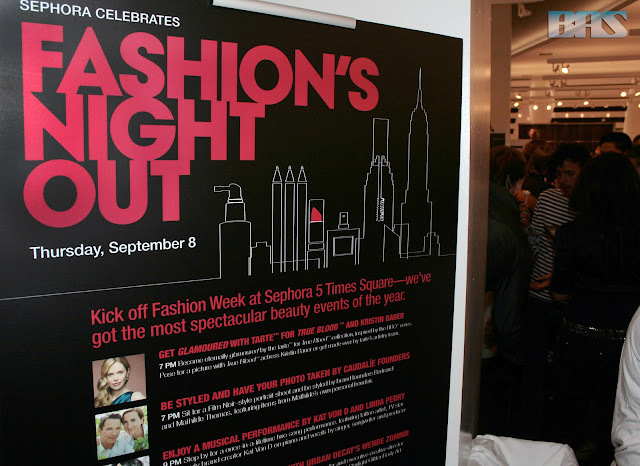 Every store in NYC on September 8th special guest in fashion, entertainment, beauty and beauty workshops. 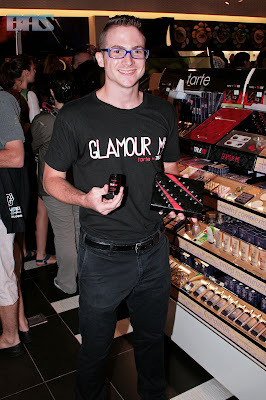 Sephora was basically a fashion convention that day. On the bright side you had a lot of stores to choose from meet and greet guests and check out events, but of course like any convention you had to wait in long lines. So of course if you didn't to one store early enough you were going to be waiting outside for a while. The Times Square locations were convenient because the distance between them weren't that bad, but again going to one store for one event could have led you to missing out on another event at one of their other stores. The best thing about Sephora's Fashions Night Out event was that for any lady that didn't have the time to fully look their best, nail and hair stations were available throughout the night at practically every store. So every woman in NYC was covered for a night out on the town. As I said before every store had its own mini event filled with guest and entertainment as well as workshops. At Sephora on 5th Avenue, supermodel Josie Maran was there shooting her latest campaign live, you could pose for a photos taken by Smashbox founder Davis Factor, or engage with the Ask the Expert Panel: Vogue Beauty Director Sarah Brown, Stylist Oscar Blandi, Urban Decay's Wende Zomnir, and Hollywood Facialist Kate Somerville. At the Times Square location on Broadway, complimentary skincare consultations were available from Park Ave. dermatologist Dr. Sadick, and Lancome video makeup artist Michelle Phan was also on hand. I attended the Times Square 7th Ave location, along with model/cosplayer/friend Mei Hoshi who looked absolutely stunning that night. More like a celebrity than most of the celebrities that were out that night and arriving just as fashionably late. There were stations for getting your nails done, featured hair stylists were on hand giving woman curls, as well as hair care tips, a station to get glitter lips or a glitter design done on any part of your body. At the other end of the store you could have done a glamour photo shoot. A dj played throughout the night, spinning mainly hits and some house music that kept the event very lively. While the event was to start at 7 the crowd size was already getting huge by that time. At the Sephora further up the block the line was already wrapping around the train station. The 3 biggest promotions for this Sephora were the make up stations that were there to promote the new line of make up based on the HBO series “True Blood” called “Tarte” with a color palette that was full and rich like the blood that is consumed and spilled on that show. True Blood's Kristin Bauer also made an appearance to say hi to fans and take photos with them as well. She was kind enough to come out three times that night to take photos with everyone and there was still a huge crowd waiting outside. Later on that evening Kat Von D and Linda Perry made their way into the store and began setting up for their performance. Mei and I stayed for their first song, and it was beautifully done. Even though most of the other events were almost over, we made our way to the Sephora near Toys R Us to see what was left. Out in front of that store they had more tents for featured products, inside they had a group of female dancers doing a beautifully choreographed number. With everything that was going on that night in terms of other fashion shows, Sephora really made going to their stores an event to remember. 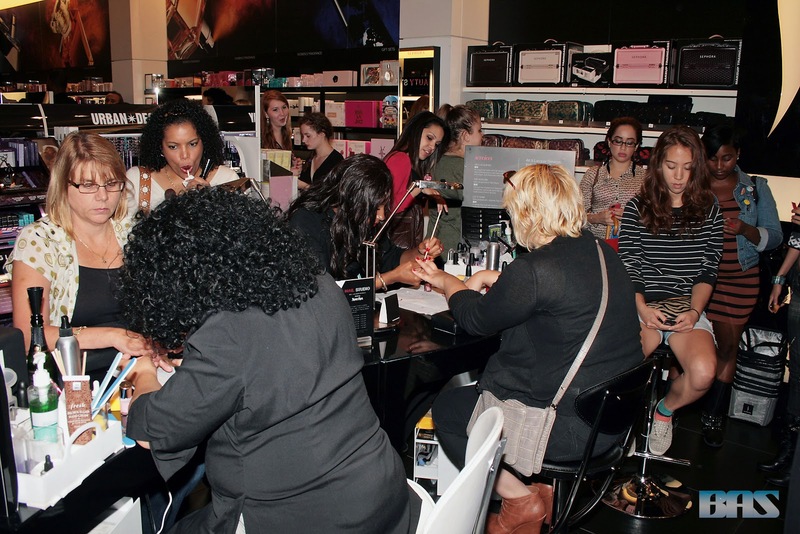 Other store's events included: Sephora Lexington Ave professional brow service from a Benefitesthetician while meeting with Benefit's Global Beauty Authority: Maggie Ford Danielson, consultations with celeb dermatologist Dr. Dennis Gross, and guest appearance by Tokyo's Hello Kitty designer Yuko Yamaguchi. At Sephora Columbus Circle, Peter Thomas Roth drew and gave away custom portraits drawn with the new Lashes To Die For Liner, and you could be entered to win this season's bold lip from Buxom and BareMinerals. 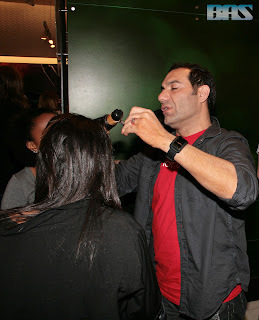 At their 34th Street location, Celebrity Makeup Artist, Joey Maalouf, was on hand to teach Temptu tricks and Nail tips from Thea Green (founder or Nails, Inc.). And finally at their Flatiron location Tokidoki creater Simone Legno did live drawings, bringing his characters to life.